Now that you are proficient in classical cross-country skiing you may be ready to expand your skills. While classical style is great for distance and endurance skate skiing is a faster technique for the sprinters out there. Success will be easier to attain if you spend a good number of days practicing on groomed trails, as learning on ungroomed terrain is extremely difficult. Like all forms of skiing, skate skiers stand with their knees and ankles slightly flexed, hips leading, and body relaxed and upright. Start by standing in a slight V stance. Tip one ski on it’s inside edge and push off, gliding on the other ski. Place the first ski flat on the ground while tipping and pushing the other. Repeat. As simple as that, you are skating. Adding poles increases power and momentum, but is not required for balance, so don’t be afraid to try skiing without them first. When you choose to use poles, use the double pole motion from your classical technique. Swing both arms forward, slightly bent at the elbow and wrists, planting them simultaneously on the outside, forward of each ski tip. Push back, swinging by your hips and following through. The verbal queues for the V2 Alternate or Open Field Skate stride, "push and glide,” set the rhythm. As you say, “push,” push with your poles and the tipped ski; as you say “and” transfer your weight to the gliding ski and finish your follow through; as you say “glide,” drive your weight down and tilt the ski while you swing your poles forward, restarting the sequence for the other leg. You are pushing off your leg and poles together, so each step gets assistance with a pole push. The V2 requires the most balance. Rather than using a double pole push with each separate leg push, one pole push will coincide with two steps. So think of your rhythm as "push and glide and”, “push” will start the arms and right leg, during the first “and” you will move your weight and glide on the left ski. “Glide” will queue you to push off the left ski, continuing the follow through of your arms; during the second “and” you will glide on the right ski and return the poles to the start position ready to push on your right ski again. Once you’ve gotten the rhythm and are ready to move up you may find the V2 doesn’t give you quite enough power. The V1 or Off Set Skate will provide the power and momentum to get you up steep grades. With the V1, skiers use the double pole push, with both the pushing ski and gliding ski, quickening the pace of the polling. When the V1 is not possible, the Diagonal V-Skate is a simple option. V-skate with your legs, tilting the right ski, pushing off it and gliding on the left, repeating the other way. 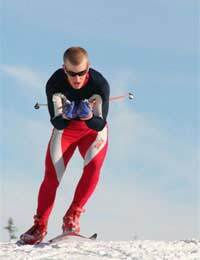 Add single arm pole plants, as in the opposite-arm opposite-leg motion of the diagonal stride in classical skiing. The combination allows faster movements for more momentum to get you up the hill. Despite the technical names of each type of gliding step, skate skiing is fairly easy. If you get confused, just stop, breathe and start again. Don’t think too hard just let the rhythm come. If the stress of trying to balance on narrow skis causes cramping in your feet or ankles, take a break and stretch. After a few days on XC skis, your body will get used to them, and cease protesting. Skate skiing is great aerobic exercise and often preferred by those who like the purity of human speed.